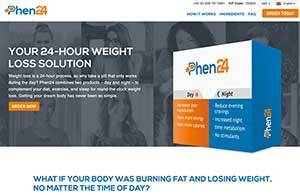 Phen24 Review – The body is a biological machine that runs on calories and it burns them 24-hours a day. 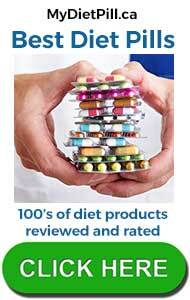 Most weight loss supplements are designed to encourage the body to burn more calories than normal. This is achieved by the use of ingredients that speed up the metabolism. However, a lot of formulations prove to be unfit for their purpose and even the ones that work in the intended way are usually only designed to boost the body’s calorie burning potential during the day. Nobody is saying such supplements have no value, but if the body’s calorie burning ability could be enhanced to burn calories day and night—even while sleeping—the weight loss process could be a lot faster. Enter Phen24 . 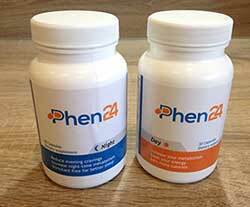 . .
Phen24 is diet supplement brought to market by Wolfson Berg Ltd. It consists of a morning and night formulation that come in separate bottles, but are designed to be used alongside each other in conjunction with a healthy diet and exercise. The daytime pill is taken once a day, with breakfast, and two of the nighttime pills are taken every evening, 15 minutes before dinner. Both formulations have the ability to boost the metabolism. So, if the blend of ingredients used in the two products is strong enough, use of the two formulations should cause the body to burn calories faster. Presuming a sensible diet, this should results in such a lack of calories the body will be constantly forced to begin burning fat for extra energy. However, this is where the similarity between the two blends ends because Phen24 Day also contains energy-providing ingredients. Phen24 Night offers just the opposite because the formulation is designed to help users wind down and enjoy a better quality of sleep. The reason for this is simple. Scientific evidcence suggest a body that is not adequately rested is more likely to put on weight. Provides Energy: The formulation contains caffeine and its reputation as an energy-provider is second to none. Phen24 Day offers a double helping because it is also contains guarana. The normal caffeine will kick-in quite fast, but guarana releases caffeine slowly, so the benefits will be slower to arrive, but longer lasting. Increases the Metabolism: Caffeine has been proven to possess this ability. The formulation also contains some cayenne and it’s a proven metabolism booster as well. Burn More Calories: When the metabolism is faster, calories are burned more quickly. 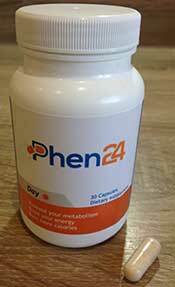 Phen24 Day contains ingredients that are known to be effective for boosting the metabolism, so this claim can be supported as well. Iodine: Assists weight loss by helping ensure a sluggish thyroid gland does not result in an inefficient metabolism. Zinc Citrate: There appears to be a link between zinc levels and body fat storage and loss. Manganese: Helps with carbohydrate metabolism. Phenylalanine: An ingredient that can ease the dieting process by improving the mood. Reduces Evening Cravings: Glucomannan provides a feeling of satiety that naturally suppresses the appetite. Increases Night Time Metabolism: Green tea extract has been proven to be effective in this area. Provides Better Sleep: Griffonia extract relaxes the mind and encourages restful sleep. Hops also have proven value as a sleep aid. Vitamin B1, Vitamin B5, Vitamin B6, Vitamin B7: Necessary for an efficient metabolism. Chromium Picolinate: Regulates insulin levels and reduces the desire for sweet food and snacks. Molybdenum: Aids the extraction of nutrients from food. Choline Bitartrate: Improves lipolysis and assists with fat burning. Ascorbic Acid (Vitamin C): A lack of Vitamin C has been linked to weight gain. Side Effects and Health Warnings. Phen24 is not suitable for women who are pregnant or nursing a child. People who have existing health problems should check with a physician before commencing supplementation. Phen24 contains some good ingredients that are capable of providing the kind of benefits the manufacturer promises, plus several more. 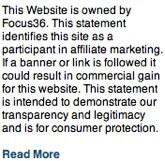 It’s a strong product, sold at a reasonable price, and it is backed by a money back guarantee. This one is a no-brainer. 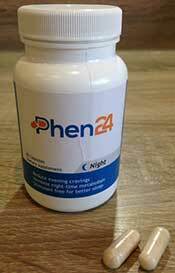 If you are looking for a weight loss supplement that will deliver fast results, Phen24 is an excellent choice. 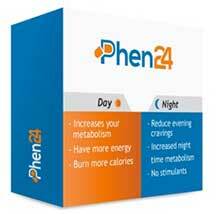 A 30-day supply of Phen24 Day and Phen24 Night is available only from the official website. Customers can buy one months supply or up to 5 months. There are significant savings on buying more than one months supply. The official website is in several languages and currencies – there is also a 60 day refund and free worldwide delivery.